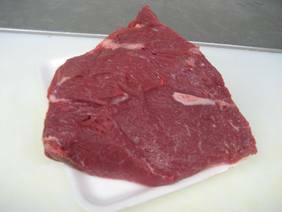 The rump comes from a portion of the beef that lies partially in the round and partially in the top sirloin. This triangular shaped roast makes a juicy beefy roast at a reasonable price. A rump that contains a moderate amount of fat and marbling, will be moist and tender enough to oven dry roast. However we also like to cook a rump using the pot roast method, follow the instructions for cooking blade roast, this method gives it great flavor and the rump will not be as dry. To bring out additional flavor and produce a more buttery texture you can dry age the roast for a few days. Age the beef in the refrigerator by leaving it uncovered on a wire rack over a pan to catch the drippings for at least a day or as long as 3-4 days. Bacteria grows from the outside and a way to get rid of bacteria is to sear the roast first. Searing the roast will seal in the juices leaving your rump roast recipes looking very appealing when being served. 1. An hour before cooking, remove the roast from the refrigerator to bring to room temperature. 2. Preheat the oven to 250 degrees and set the rack to the lower middle position. Season with salt and pepper and generously sprinkle your favorite seasonings, such as onion or garlic powder etc. Cloves of garlic may be used cut in half lengthwise and with a small knife cut small slits into the top of the roast and insert the garlic clove halves into the roast. 4. Transfer the pot to the oven and cook, uncovered until an instant-read thermometer inserted into the thickest part of the roast registers 130-140 degrees, about 1-2 hours depending on size and shape. I recommend checking the temperature 45 minutes to 1 hour after entering the oven. 5. Remove the rump roast from oven and tent with foil. Let it rest at least 15- 20 minutes to allow the juices to redistribute themselves evenly throughout the roast. Cut across the grain into thin slices. Below is a cooking chart for the oven rump roast. Remember you should always use an instant-read thermometer to check the doneness of a roast. The internal temperature will rise about 5-10 degrees during resting time, remove the roast 5-10 degrees before desired doneness. A thermometer will eliminate the guess work when learning how to make roast beef.